Old Republic Home Protection is one of the top home warranty providers in the US. With plans available in most states, the company offers a range of coverage with plans which shield homeowners from the cost of unexpected repairs and replacements for home appliances and systems. In business since 1974, Old Republic Home Protection has a good reputation with most customers. There have been some complaints, mostly relating to disputed coverage. When viewed in the context of the total number of customers, however, registered complaints are relatively few in number. The company has maintained and A+ rating with the BBB since becoming a member in 1996. Coverage ranges from Standard coverage which covers most major systems and appliances to Platinum Protection plan upgrade which is the company’s most comprehensive coverage. They offer coverage for construction, carpentry, some plumbing, vents as well as heating and air conditioning systems. Additionally, a wide variety of coverage is available for specialty items such as pool and spa equipment, septic systems, water softeners and more. The various plans are explained in detail on their website. Premiums vary by state and range from $260 – $500 annually depending on coverage, so it is important you thoroughly weigh the options to fit your specific needs. As with all types of service contracts, it is vital that you have a clear understanding of what is covered and what is not. Again, the majority of complaints about the company are due to misunderstandings about the coverage. 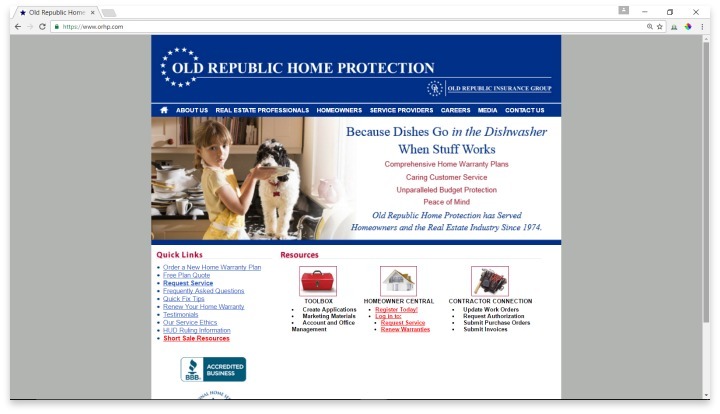 The nation’s third largest home warranty company, Old Republic protects their customers against expensive repair and replacements of household appliances. Old Republic Home Protection is a leading home warranty company which offers coverage throughout the United States. Most of their plans are made available through real estate agents giving peace of mind to prospective homeowners considering the purchase of a previously owned property. The company’s vision is to be People Helping People striving to provide good customer service and ensure that all their customers are satisfied. The majority of negative reviews are from customers who did not receive the coverage they expected. There are also some reports of poor quality customer service, however, given the many thousands of satisfied customers over several decades, the company maintains a good reputation in the industry. Have you had an experience with this company? Please share your Old Republic Home Protection reviews below.